These 2” stickers come individually perforated on rolls of 1,000. Use exactly the amount you need for your upcoming event and store the rest for later use. Roll of 1,000 only $53.95 per roll. *STICKER SALE! 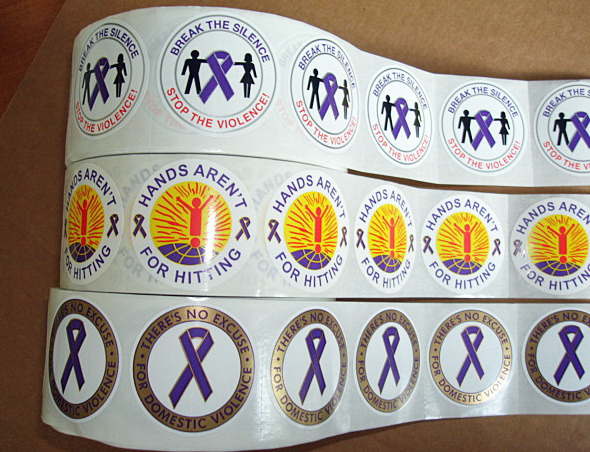 When you purchase any combination of *three or more rolls of our Domestic Violence Awareness Stickers for the sale price of $48.95 per roll… you will also receive one of our Domestic Violence Awareness Posters….Free! *Price includes a 10% quantity discount. *See the STICKER SALE window below to choose this offer. 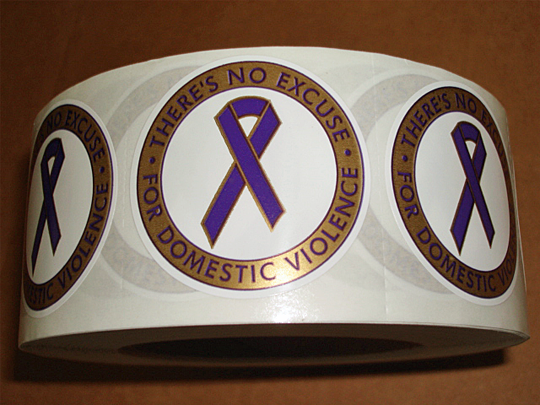 *STICKER SALE-Choose any 3 Rolls of our DV Awareness Stickers, only $48.95 per roll. *STICKER SALE! Purchase three or more rolls of our DV Stickers for the sale price of $48.95 per roll… and you will also receive a DV Awareness Poster Free! Choose all one design or any combination of designs. Regular price is $53.95 per roll. 1-1/2" button with color imprint, only $0.50 each. See info page for sale packs.